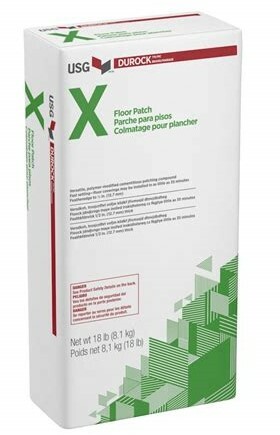 Durock Brand X Floor Patch is a polymer-modified, cement-based patching compound for interior use over concrete and approved wood subfloors. Ideal for renovation projects, this economical floor patch provides a smooth skim coat for accepting floor coverings. Easy to mix and apply, USG Durock™ X floor patch is fast drying; floor coverings can be installed in as little as 35 minutes depending on floor patch thickness and drying conditions.